Here’s my interview with Kim Gordon in the latest issue of Time Out New York, also reprinted here in its entirety because I love her. Unlike many of its alt-rock peers, Sonic Youth has never once broken up in its 27 years on the planet. “We’re boring,” laughs Kim Gordon, the band’s 55-year-old bassist and singer. “There’s not a lot of high drama.” While the lack of turmoil has prevented Gordon and her bandmates (including husband Thurston Moore) from cashing in on a reunion tour à la the Pixies or My Bloody Valentine, the legacy Sonic Youth has created over the course of countless albums might just be more valuable than money. Gordon and family now reside in Northampton, Massachusetts, but she called us while in New York recently to promote Sonic Youth’s free Fourth of July show in Battery Park, as well as her side project Free Kitten, whose new album, Inherit, is that band’s first in 11 years. Time Out New York: Welcome to TONY issue 666, Kim. Are you the devil? Kim Gordon: No, I’m a slayer wanna-be. I watch Buffy the Vampire Slayer with my daughter. We’re very into Buffy and Buffy’s friends. TONY: You’re a superhero fighting the devil, then? Kim Gordon: Actually, I’d rather be the sidekick. Like, the good witch who helps. TONY: Seems appropriate. Burning question: Is it Free Kitten as in you’re giving away a kitten, or is it to release, as in Free Mumia? Kim Gordon: You know, it’s all in the eye of the beholder. TONY: Fair enough. So, in an all-female alt-rock bass-off, who would win: you, Kim Deal or D’arcy? 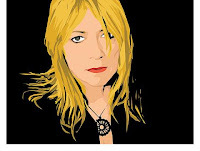 Kim Gordon: D’arcy? D’arcy who? [Laughs] I don’t know. Probably Kim [Deal]. But I don’t think of myself as a musician. I’m more of a visual artist who happens to play the bass. I picked up the bass kind of postpunk-style. There’s a real art to not learning how to play an instrument and being able to still play it. TONY: Almost three decades in, how are the ears holding up? Kim Gordon: Since we moved out of New York, I think they’re a lot better. TONY: How does the quintessential New York band get away with living in Western Massachusetts, anyway? Kim Gordon: Well, only half of us live there. TONY: True. Were you and Thurston done with New York? Kim Gordon: New York is really just a different state of mind now. I think we were ready for something else. And it’s kind of interesting living on the edge instead of being in the middle and being somewhere that’s not “cool” necessarily—although I have to say Northampton is pretty hip. TONY: And a lot quieter. Kim Gordon: I couldn’t believe it. I went into Bloomingdale’s today just to look for some necessities. And they were playing some music that was so noisy! I don’t know who it was, but when it went into this really sort of noisy part at the end, I was looking around to see if anyone was even listening. It was almost shocking. TONY: A member of Sonic Youth complaining about loud music?!? Kim Gordon: It’s more the kind of music it was. I’ll leave a store if I hate the music. If it’s just, like, techno, I feel like my brain is going to explode. TONY: Speaking of bad music, has a crappy band like Live or Creed ever opened for you? Kim Gordon: Not that I can think of. I probably wiped it out of my mind. Oh, wait—that band Nirvana? They were embarrassing. TONY: You switched to a major label in 1990—any regrets about how it affected your legacy? TONY: But there must have been some perks to being on a major label. Kim Gordon: It did give us a high profile, maybe. And it did open up opportunities that may not have happened. And we got health benefits. Kim Gordon: Yeah. For every record sold, they paid a penny toward health insurance. See, no one knows things like that because [ornery record producer] Steve Albini doesn’t ever talk about it. Too much liquid anger last night. Posted on July 2, 2008 by johnsellers	This entry was posted in Uncategorized. Bookmark the permalink.